When it comes to choosing between South Bass Island and Put-in-Bay or Kelleys Island, I’m hard pressed to choose a favorite. 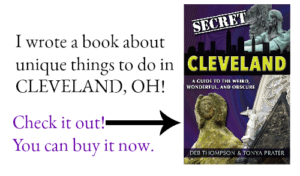 While both are islands in Lake Erie, they are both very different and each have very specific benefits. 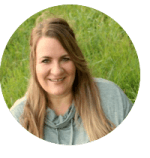 When I think of South Bass Island, I think of someplace busier, bustling with people and plenty of options for entertainment; whether that would be family friendly fun, a romantic couple getaway, or as an action packed guys or girls night out. There truly is something for everyone. Sure you can seek out the slow paced activities on South Bass Island as well, but if you’re looking for entertainment, you don’t have to look too hard to find it. 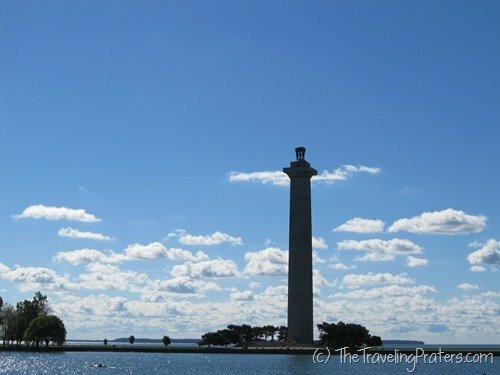 Kelleys Island may be the largest of the Lake Erie American islands, and the Walleye Capital of the World, but you can expect to find fewer crowds, less commercialism and plenty of island charm. 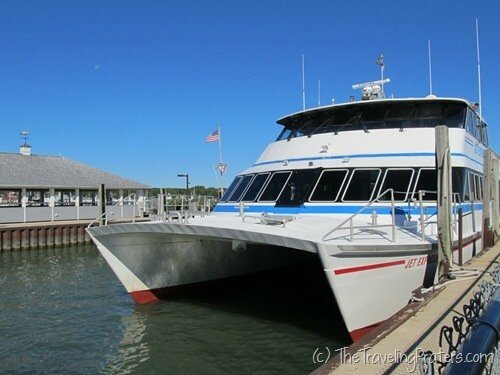 We boarded the Jet Express in downtown Put-in-Bay for a 15-20 minute ferry ride to Kelleys Island. Jet Express offers plenty of seating, with comfortable upholstered seating in a climate controlled atmosphere downstairs, with open air seating upstairs. We sat outside to fully experience the view and wished we’d dressed in layers. The combination of the speeding ferry and morning air left us feeling a bit chilly. 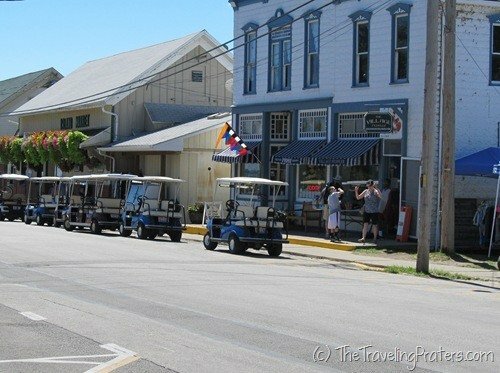 If you take the Kelleys Island Ferry directly from Marblehead, you could take your own vehicle but we found it just as easy to join the islanders and hop in the vehicle of choice, the golf cart. This was the highlight of the day for my kids. 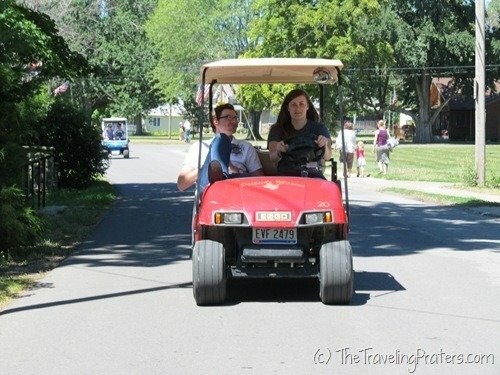 They loved driving the golf cart around the island and my husband and I were happy to sit back, relax and allow them to play chauffeur. We didn’t waste anytime exploring the island after picking up our golf carts from Portside Marina and headed headed directly to the Glacier Groove Memorial. I was disappointed to realize that walking is not permitted to walk on the glacier grooves. 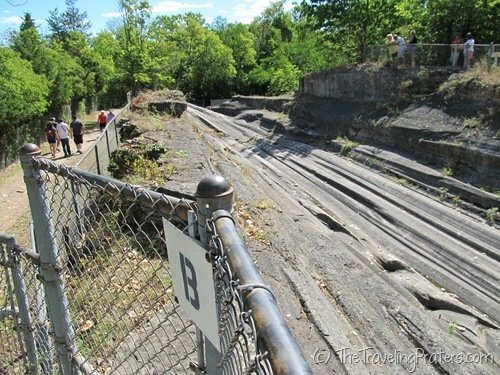 Understandably, we found a fence blocking access to this National Natural Landmark, but we did get a good view of the world’s largest example of glacier grooves. Along the fence you’ll find placards with information about the formation of the grooves and learn why it’s so important to protect the grooves. This was a quick stop that could take only a couple minutes to view the grooves up to 30 minutes or so if you wish to read all of the information on the signs. Almost directly across from the parking lot of the glacier grooves, you’ll see the entrance to the sandy public beach at Kelleys Island State Park. We stopped to walk barefoot in the sand and to wade out into the lake. The water was beautiful and the beach wasn’t crowded so we stuck around to allow the kids could swim for a bit before heading off to explore the rest of the island. 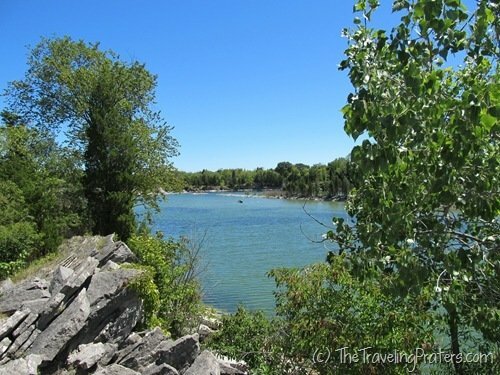 Kelleys Island State Park offers a boat launch, swimming, several hiking trails, a mountain bike trail and kayak rentals in season. Nearby you’ll also find points to snorkel and scuba dive where you can see some of the ship wrecks off the island. As we rode past the camp ground, the kids excitedly began planning a return trip to Kelleys Island- this time with friends. We enjoyed seeing the historic homes on the island which are listed on the National Register of Historic Places but disappointed that we weren’t able to visit the history museum which was closed during our visit. We made a quick stop to the General Store so I could collect a few smashed pennies on the porch. We began making our way through each of the downtown shops as we slowly inched our way back to the waterfront where we planned to grab a bite to eat at Dockers. 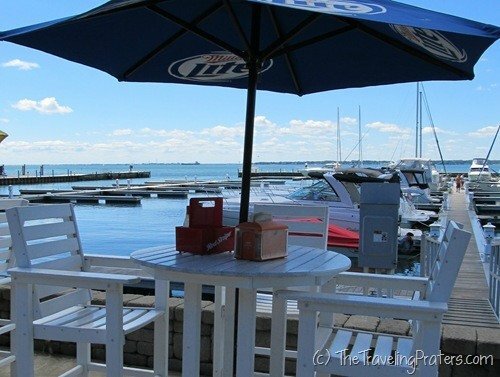 Dockers Waterfront Restaurant offered incredible lake views, wonderful service and one of the best Rib-eye sandwiches I have ever eaten in my life! 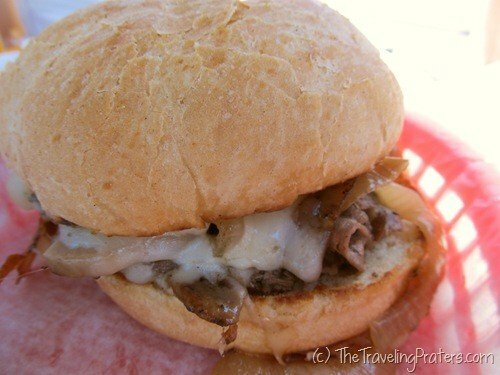 My mouth still waters at the thought of all that yummy-ness! 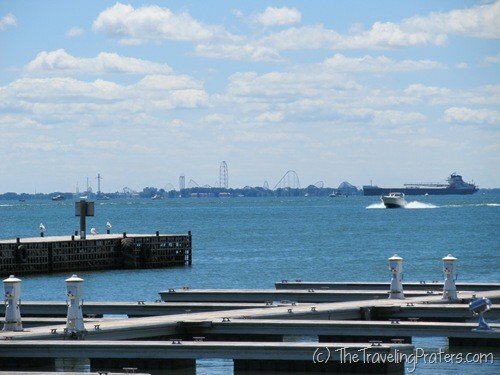 My kids were impressed that they could see all the way to Cedar Point from the dock and began to point out the roller coasters one by one. With our bellies full, we hit the pavement in our speedy golf carts once more to continue our trek around the island. 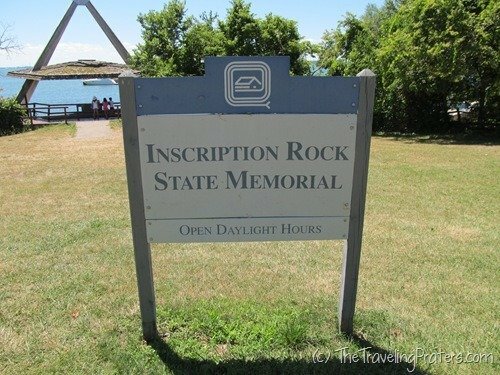 Next stop, Inscription Rock State Memorial. The flat topped boulder is covered in the barely visible remnants of pictographs, believed to have been carved approximately 300-400 years ago. Honestly, I had a hard time making out the images so thankfully there is a metal plate attached to the information sign that locates and identifies each of the symbols. 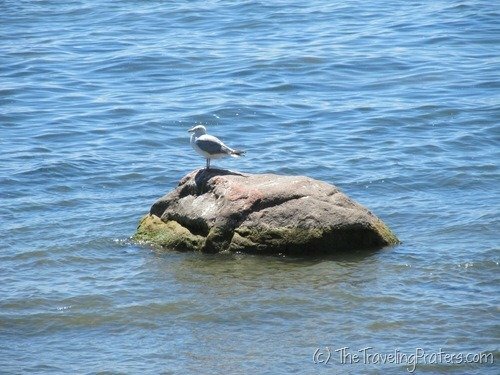 We took our time driving along the shoreline enjoying the views. 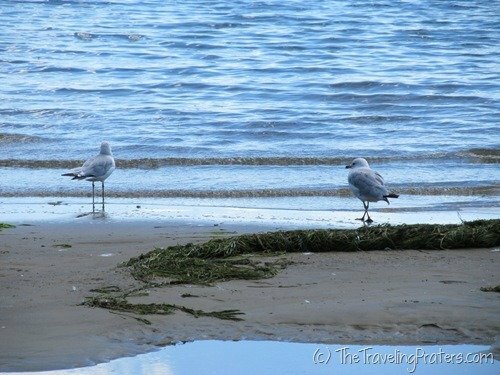 We stopped on occasion to snap a few pictures along the shoreline, relishing every relaxing minute on the island. And after taking the long way around the island, we came to one of the entrances to the East Quarry Trail. We took a quick, easy hike to the quarry which offered an amazing view. For a few minutes it was hard to believe that we were still in the state of Ohio. Much to soon we returned the golf cart, and hastily made our way to the dock to catch the ferry back to South Bass Island. And there we waited. And waited. And waited. My husband even fell asleep waiting. Guess who misread the ferry schedule? Yep. That would be yours truly. Still the slight mishap couldn’t begin to put a damper on the wonderful family friendly day we’d experienced at Kelleys Island. 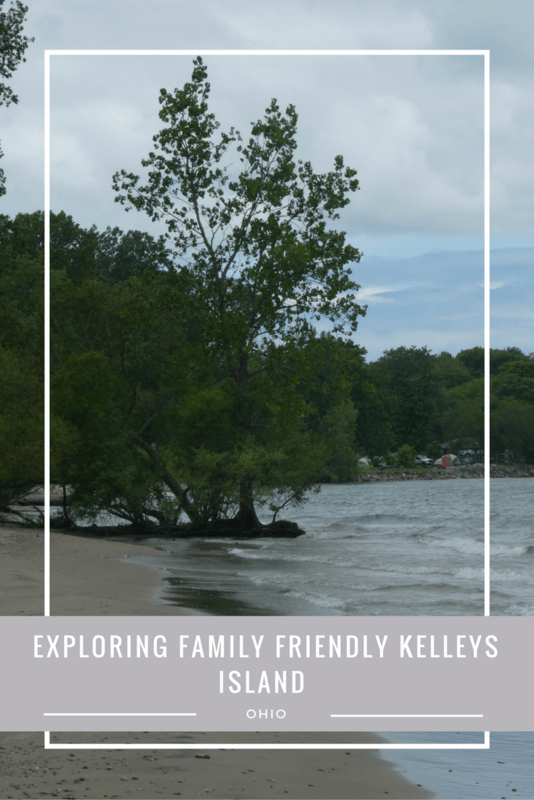 Have you been to Kelleys Island? Which aspect of our day do you think your family would most enjoy? Special thanks to Lake Erie Shores and Islands for making all the arrangements for our trip. All opinions are 100% mine. My kids would have just spent the whole day driving the golf carts. The glacier grooves look interesting, and that sandwich shot is making me hungry. Looks like such a relaxing vacation. I’ve never heard of glacier grooves – sounds pretty cool.